Tariq Ramadan accuses me of lying, a charge I take seriously. But, as so often is the case with Islamists and other totalitarians, the accuser himself stands accused. can be achieved not via the get-along multiculturalism that you propose, but by standing firm with our civilized allies around the globe, and especially with liberal voices in the kingdom of Saudi Arabia, with Iranian dissidents, and reformers in Afghanistan. I also propose standing with their counterparts in the West, with such individuals as … Magdi Allam, an Egyptian who is now a leading Italian journalist; Naser Khader, a parliamentarian in Denmark; Salim Mansur, a professor and author in Canada, and Irfan Al-Alawi, an activist here in Britain. Professor Daniel Pipes spoke about moderate Muslim and by the way, he mentioned this morning about an Egyptian Copt as moderate Muslim in his debate. Professor Ramadan said, "The fact he was mentioning was wrong. He was lying. By the way, he is a Copt. He is an Egyptian Christian. But he has an Arab name." Note two initial points here: (1) Ramadan does not say I was mistaken in identifying Allam as a Muslim, but that I "was lying." He thus implies I know Allam to be Christian but deceptively called him a Muslim. Strong words on Ramadan's part. (2) Strange words, actually, given that I did not, either in the above excerpt or anywhere else in my London talk, identify Allam as a Muslim, only as a one of several "civilized allies." Ramadan gratuitously inserted me into an obscure argument over Allam's religious adherence. Magdi Allam, "Vincere la paura. La mia vita contro il terrorismo islamico e l'incoscienza dell'Occidente." "The Islam that I have lived, the Islam in which I was born and raised..." ("L'islam che ho vissuto, l'islam in cui sono nato e cresciuto..."), p. 27. "My mother, who has always been a practicing Muslim, ..." ("Mia madre, che e' sempre stata una musulmana praticante, ..."), p. 32. "My parents were both Muslims, they believed in the same God and shared the same set of values and culture" ("I miei genitori erano entambi musulmani, credevano nello stesso Dio e condividevano il medesimo sistema di valori e culturale"), p. 37. Allam acknowledges thinking about conversion to Christianity on moving to Italy so as to fit in better, but he never took this step. He has no links to the Copts. 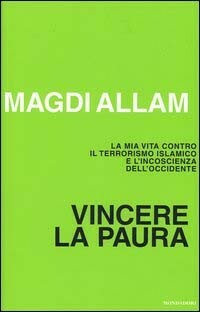 The publisher's blurb for Vincere la paura sums up Allam's self-presentation: "Magdi Allam describes himself as a secular Muslim born and raised in Nasser's Egypt" ("Magdi Allam racconta se stesso, musulmano laico nato e cresciuto nell'Egitto di Nasser)." Whence, then, Ramadan's calumny about Allam being a Copt? Because of bad blood between the two men, both Europeans of Egyptian origin. For example, Allam's autobiography includes an "Open Letter to Tariq Ramadan" ("Lettera aperta a Tariq Ramadan") that exposes Ramadan as an extremist and because Allam refused to appear with Ramadan, the latter was denied an award from the PEN American Center. Ramadan has allies in this claim, such as the Unione delle Comunità ed Organizzazioni Islamiche in Italia ("Union of the Communities and Organizations Muslims in Italy") and one Miguel Martinez, a polemicist engaged in a sustained campaign to malign and discredit Allam. At minimum, casting Allam as a Copt blunts his important anti-Islamist voice. Maximally, identifying him as an apostate from Islam endangers his life. It is no secret that Allam makes no move without his multiple, around-the-clock, state-supplied bodyguards by his side. 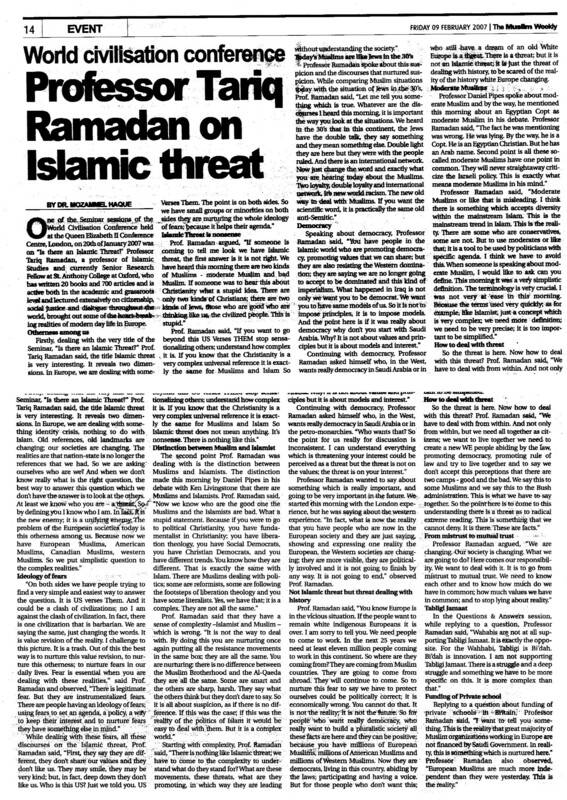 Ramadan, to his permanent shame, is party to this endangerment of a brave and creative Muslim thinker. So, to review: Magdi Allam was born a Muslim, grew up a Muslim, and identifies today as a Muslim. But Ramadan deems him a Christian. I called for standing by Allam. Ramadan says I "was lying." Dear Reader: Who do you consider the liar here? His twice stating, falsely, that I was behind his exclusion from the United States, then denying he had ever said this. Mar. 5, 2007 update: For more on this subject, see "Tariq Ramadan, Magdi Allam, and Me - Updates." Related Topics: Egypt, Freethinking & Muslim apostasy, Muslims in Europe | Daniel Pipes receive the latest by email: subscribe to the free mef mailing list This text may be reposted or forwarded so long as it is presented as an integral whole with complete and accurate information provided about its author, date, place of publication, and original URL.